Welcome to the family West Highlands! Students, staff and community members from Amherst celebrated the official opening of West Highlands School on Monday, June 8th. Education and Early Childhood Development Minister Karen Casey was joined by students and representatives from the Chignecto-Central Regional School Board, the Town of Amherst and departments of Transportation and Infrastructure Renewal and Education and Early Childhood Development. 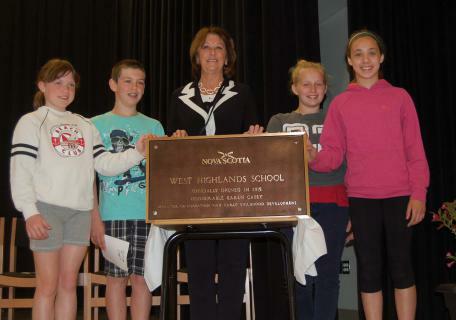 "For decades, Amherst's students have received a strong start in school at West Highlands," said Ms. Casey. "That strong start will continue at the new West Highlands School, a modern school built through collaboration with the school board and community." The province invested $11.9 million with additional contributions from the Town of Amherst and local community for a larger gymnasium. The school also features a music room, visual arts room, Early Years Centre, SchoolsPlus area and sports field. The school serves students from grades Primary to 6. "A new school is always exciting, but I think this new school means a little more to us because we have moved from a facility that was over 100 years-old, to a state-of-the-art space," said Kevin Mapplebeck, principal, West Highlands School. "This new school provides our students with boundless opportunities to learn and grow. We couldn't be more excited." To connect the new school with its historic predecessor, the bell from the old West Highlands Elementary School has been restored and is now in a prominent location in the lobby of the new school. "West Highlands School is a modern facility that's very welcoming for students, staff and visitors alike," said Trudy Thompson, chair of the Chignecto-Central Regional School Board. "West Highlands is home to our board's first Early Years Centre and a SchoolsPlus site, two very important services for students and their families."